Helena Bonham Carter at 26th Santa Barbara International Film Festival in 2011. ↑ 1.0 1.1 1.2 Costa, Maddy (3 November 2006). "It's all gone widescreen". The Guardian (London). http://film.guardian.co.uk/interview/interviewpages/0,,1937548,00.html। আহৰণ কৰা হৈছে: 6 October 2010. ↑ "Helena Bonham Carter Biography (1966–)". FilmReference.com. 2007. http://www.filmreference.com/film/39/Helena-Bonham-Carter.html। আহৰণ কৰা হৈছে: 6 October 2010. ↑ The Scotsman, 23 July 2005, Gillian Welsh, "Scruffs up nicely"
↑ "Helena Bonham Carter Biography". Tiscali. 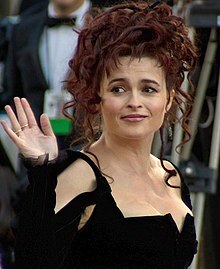 http://www.tiscali.co.uk/entertainment/film/biographies/helena_bonham_carter_biog.html। আহৰণ কৰা হৈছে: 7 February 2009. ↑ 7.0 7.1 "Zen and the inner ape". The Daily Telegraph (London). 2 August 2001. http://www.telegraph.co.uk/arts/main.jhtml;jsessionid=XYOLEDXNAVCKRQFIQMFCFFOAVCBQYIV0?xml=/arts/2001/08/02/tlape02.xml&page=2। আহৰণ কৰা হৈছে: 19 January 2008. ↑ "Breaking the Waves". Deep Focus. 7 January 2004. http://www.deep-focus.com/flicker/breaking.html। আহৰণ কৰা হৈছে: 7 October 2008. ↑ "Cannes Film Festival 2006 Official Juries". Go France. 7 October 2008. http://gofrance.about.com/od/cannesfilmfestival/a/cannes2006jury.htm। আহৰণ কৰা হৈছে: 7 October 2008. ↑ Lewis, Leo (28 June 2007.). "Harry Potter and the Order of the Phoenix: the first review". The Times (London). http://entertainment.timesonline.co.uk/tol/arts_and_entertainment/film/film_reviews/article2000948.ece। আহৰণ কৰা হৈছে: 13 July 2007. ↑ Daly, Steve (13 July 2007). "Helena Bonham Carter Gets Wicked". Entertainment Weekly. http://www.ew.com/ew/article/0,,20044270_20044274_20046035,00.html। আহৰণ কৰা হৈছে: 13 July 2007. ↑ "Helena Bonham Carter Set to Play Mrs. Lovett in Sweeney Todd Film". Broadway.com. 18 October 2006. http://www.broadway.com/gen/Buzz_Story.aspx?ci=538813। আহৰণ কৰা হৈছে: 13 July 2007. ↑ "Terminator 4 Gets Helena Bonham Carter!". ScreenRant. 1 July 2008. http://screenrant.com/terminator-4-helena-bonham-carter-niall-2837/. ↑ Betts, Hannah (22 April 2006). "English eccentric". The Times (UK). http://women.timesonline.co.uk/tol/life_and_style/women/celebrity/article707405.ece। আহৰণ কৰা হৈছে: 29 June 2009. ↑ "Burton brings Hollywood to Cornwall". This is Cornwall. 29 September 2008. http://www.thisiscornwall.co.uk/homepagenews/Burton-brings-Hollywood-Cornwall/article-359753-detail/article.html। আহৰণ কৰা হৈছে: 29 September 2008. ↑ "Bonham Carter and Hathaway Join "Alice in Wonderland"". JoBlo.com. 7 October 2008. http://www.joblo.com/index.php?id=23340। আহৰণ কৰা হৈছে: 7 October 2008. ↑ "Hathaway and Bonham Carter Join Alice in Wonderland". Cinematical. 7 October 2008. Archived from the original on 30 July 2012. https://archive.is/nguK। আহৰণ কৰা হৈছে: 7 October 2008. ↑ Christopher, James (12 January 2009). "The best British film actresses of all time". The Times (London). http://entertainment.timesonline.co.uk/tol/arts_and_entertainment/film/article5502980.ece। আহৰণ কৰা হৈছে: 4 May 2010. ↑ "'The King's Speech' leads the pack in BAFTA nominations". CNN International. 18 January 2011. http://articles.cnn.com/2011-01-18/entertainment/uk.movie.nominations_1_bafta-drama-category-motion-picture-screenplay?_s=PM:SHOWBIZ। আহৰণ কৰা হৈছে: 30 January 2011. ↑ "'The King's Speech' usurps throne as Oscar leader". Associated Press. প্ৰকাশক Beverly Hills, CA. 25 January 2011. http://www.google.com/hostednews/ap/article/ALeqM5h64mhgpYJ5GEM-CC2KnBapPfxstQ?docId=b333e143c0cb42b0a9894766c5140067। আহৰণ কৰা হৈছে: 30 January 2011. ↑ Khan, Urmee (7 March 2009). "Helena Bonham Carter to play Enid Blyton in new BBC biopic". The Daily Telegraph (London). http://www.telegraph.co.uk/culture/tvandradio/4949678/Helena-Bonham-Carter-to-play-Enid-Blyton-in-new-BBC-biopic.html। আহৰণ কৰা হৈছে: 4 May 2010. ↑ "Helena Bonham Carter to film new movie Toast in Birmingham and Black Country". Birminghampost.net. Birmingham Post. 23 June 2010. http://www.birminghampost.net/life-leisure-birmingham-guide/birmingham-culture/film-news/2010/06/23/helena-bonham-carter-to-film-new-movie-toast-in-birmingham-and-black-country-65233-26705223/। আহৰণ কৰা হৈছে: 24 August 2010. ↑ Roxborough, Scott (21 January 2011). "'The King's Speech,' 'Toast,' 'Sacrifice' Get Galas in Berlin". Hollywood Reporter (Hollywood Reporter). http://www.hollywoodreporter.com/news/kings-speech-toast-sacrifice-galas-74379। আহৰণ কৰা হৈছে: 13 March 2011. ↑ "Toast at the Berlin Film Festival". Berlin Film Festival. Berlin Film Festival. http://www.berlinale.de/en/programm/berlinale_programm/datenblatt.php?film_id=20110122। আহৰণ কৰা হৈছে: 13 March 2011. ↑ "Number 9's slate includes new Neil Jordan vampire film". ScreenDaily. 15 May 2011. http://www.screendaily.com/news/uk-ireland/number-9s-slate-includes-new-neil-jordan-vampire-film/5027544.article। আহৰণ কৰা হৈছে: 15 May 2011. ↑ "Bonham-Carter to receive BAFTA LA honour". Cine Europa. Berlin Film Festival. http://cineuropa.org/2011/nw.aspx?t=newsdetail&l=en&did=207175। আহৰণ কৰা হৈছে: 21 July 2011. ↑ "Official: Russell Crowe & Helena Bomham Carter in Les Misérables". First Showing.net. First Showing.net. http://www.firstshowing.net/2011/official-russell-crowe-helena-bomham-carter-in-les-miserables/। আহৰণ কৰা হৈছে: 9 September 2011. ↑ "Rufus Wainwright teams with Helena Bonham Carter in new video". Digital Spy. Digital Spy. http://www.digitalspy.co.uk/music/news/a374589/rufus-wainwright-teams-with-helena-bonham-carter-in-new-video.html। আহৰণ কৰা হৈছে: 3 April 2012. ↑ "Casting: Helena Bonham Carter and Kathy Bates Star in The Young and Prodigious Spivet". Collider. Collider. http://collider.com/helena-bonham-carter-young-and-prodigious-spivet/166864/। আহৰণ কৰা হৈছে: 17 May 2012. ↑ "Prada presents A Therapy". Prada. Prada. http://www.prada.com/en/a-therapy। আহৰণ কৰা হৈছে: 21 May 2012. ↑ Dowling, Kevin (23 August 2008). "Four "relatives" of Helena Bonham Carter killed in road crash". The Times (UK). http://entertainment.timesonline.co.uk/tol/arts_and_entertainment/film/article4593978.ece। আহৰণ কৰা হৈছে: 3 May 2009. ↑ "Honoured". The Oxford Times. Press Association (Newsquest (Oxfordshire) Ltd): পৃষ্ঠা 34. 23 February 2012. ↑ 37.0 37.1 Norman, Pete (7 August 2008 August 2008). "Helena Bonham Carter Reveals Her 7-Month-Old's Name". People. http://www.people.com/people/article/0,,20217444,00.html। আহৰণ কৰা হৈছে: 3 May 2009. ↑ "Helena Bonham Carter Releases Daughter's Name". Jewish Journal. 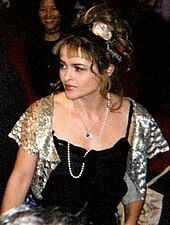 30 July 2008. http://www.jewishjournal.com/hollywood_jew/article/helena_bonham_carter_jewish_mother_20080730. ↑ Derschowitz, Jessica (18 February 2011). "Will Helena Bonham Carter bring her eccentric style to the Oscars?". CBS News. Archived from the original on 22 July 2012. https://archive.is/8GAY। আহৰণ কৰা হৈছে: 10 June 2011. ↑ "Bonham Carter in normal dress shock at Oscars". ABS–CBN News. Agence France-Presse. 28 February 29011. http://www.abs-cbnnews.com/lifestyle/02/28/11/bonham-carter-normal-dress-shock-oscars। আহৰণ কৰা হৈছে: 10 June 2011. ↑ "Johnny Depp speaks about his daughter's illness as he and Helena Bonham Carter hit the red carpet". Daily Mail (London). 11 January 2008. http://www.dailymail.co.uk/tvshowbiz/article-507371/Johnny-Depp-speaks-daughters-illness-Helena-Bonham-Carter-hit-red-carpet.html। আহৰণ কৰা হৈছে: 10 June 2011. ↑ Bergin, Olivia (9 June 2011). "Helena Bonham Carter models for Marc Jacobs". Telegraph (London). http://fashion.telegraph.co.uk/news-features/TMG8565419/Helena-Bonham-Carter-models-for-Marc-Jacobs.html। আহৰণ কৰা হৈছে: 10 June 2011. ↑ "Local Luminaries: Famous People from the Area". Buriton Heritage Bank. June 2001. http://www.buriton.org.uk/bhb/infosheet05.htm। আহৰণ কৰা হৈছে: 6 July 2009. ↑ "Paid Notice: Deaths PROPPER DE CALLEJON, HELENE". The New York Times. 7 July 1997. http://www.nytimes.com/1997/07/07/classified/paid-notice-deaths-propper-de-callejon-helene.html. ↑ Barber, Lynn (20 April 1997). "Helena Bonham Carter: Couldn't she just wear a babygro?". The Guardian (London). http://film.guardian.co.uk/Feature_Story/Observer/0,,44062,00.html। আহৰণ কৰা হৈছে: 13 July 2007. ↑ Paulson, Michael (18 August 2008). "Helena Bonham Carter as a Jewish mum". The Boston Globe. http://www.boston.com/news/local/articles_of_faith/2008/08/helena_bonham_c.html.